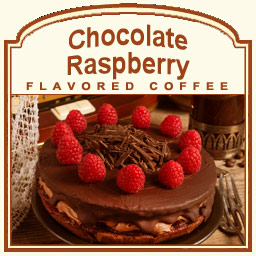 Chocolate Raspberry flavored coffee is a richly decadent, sweet fusion of berry flavor that is blended with deep, dark chocolate undertones. Freshly roasted, these 100% Arabica beans enhance the flavors of powdered sugar while making your taste buds conjure up the plump, sweetness of juicy raspberries. Extraordinary in taste, there are only 2 calories per cup of this sweetly-tart coffee. Enjoy this delectable dessert coffee any time of the day! Packaged in a heat-sealed valve bag, this Chocolate Raspberry flavored coffee will be roasted and shipped on the same day to guarantee ultimate freshness.